Audiences consume music using a range of technologies: streaming, vinyl, CD, cassette, and via digital download. Translatinga finished mix from its source format to the eventual release media in the most musically effective way is a fundamental purpose of mastering. That may sound simple. But because every format has practical limitations, even this most basic objective requires substantial technical knowledge and sound aesthetic judgment. Juggling trade-offs within those boundaries to maximize artistic impact isn’t always a trivial matter. You may already be aware that cutting a good lacquer for vinyl is a tricky, highly technical balancing act of interrelated challenges. But even at the opposite end of the technological spectrum, there will be occasional conflicts between technical and aesthetic priorities. It’s the mastering engineer’s job to reconcile these. For example, the desire to make a loud master for digital formats that rely on perceptual coding — lossy file formats like .aac, MP3, and streaming codecs — is complicated by the fact that the data compression processes involved can react very badly to loud signals. It’s the mastering engineer’s job to artfully wrestle that inherent tension. Another important goal of mastering is to ensure that the material works well across a wide spectrum of listening devices and environments. If you’ve ever been satisfied with a mix in the studio only to later discover that the kick drum both disappears on laptop speakers and sounds unacceptably boomy in the car, you’ve experienced translation issues. 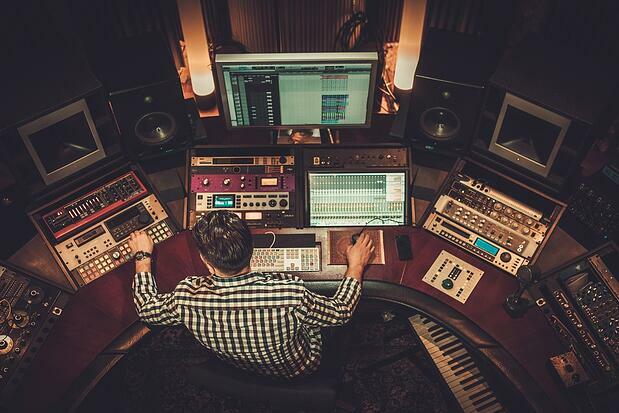 Good translation begins at the mix stage, but a mastering studio’s full-range monitors and carefully-optimized acoustics can help reveal issues that may have slipped by in a less-controlled environment. This is particularly important for mixes made in studios with acoustic challenges and/or subpar monitoring. An experienced mastering engineer who trusts their listening environment will be an expert at ensuring translation across a wide variety of systems. When we track and mix, we’re largely focused on bringing individual songs to their fullest potential. In mastering, we take a project-wide view of the music, shifting our focus to the way the songs work together. Many projects will have a few sonic outliers. Perhaps the artist wishes to include some older material or has recorded and mixed the project in a few different studios with a few different engineers. Regardless of the cause, it’s not uncommon to end up with one or two mixes that are substantially darker, brighter, narrower, wider, softer, louder, or otherwise different from the rest. Mastering is where subtle adjustments to overall level, dynamics, and timbre can help these disparate mixes hang together side by side. It’s also the chance to focus on track spacing and sequence; to determine that we need a few more seconds of silence between the end of the ballad and the beginning of the energetic song that follows. In short, mastering turns a collection of individual mixes into a unified program. Paradoxically, the mastering process also facilitates a certain type of highly detailed critical listening; an attentional focus that’s very different from what usually occurs in the mix suite. When a producer or mixer is focused on getting the music to speak in the right way on an emotional level, the occasional mundane detail sometimes slips by. A chair squeaking as the last piano note decays, a lip smack between vocal phrases, or a touch of guitar hum in a stop-time break can go unnoticed until mastering, at which point they somehow become the most obvious, bothersome things in the world! Or even on a broader level, an artist may have approved a mix, but after having lived with it for a few weeks wishes the vocal were just a touch more out front. A skilled mastering engineer is the last line of defence against such issues. As technology has progressed, the scope of adjustments and repairs a mastering engineer can perform has become staggering. Mastering won’t make a dysfunctional mix into a good one, but you might be amazed at how effectively a small issue or two in an otherwise-good mix can be addressed. When it comes to loudness and dynamic range, different audiences have different expectations. Just as the mastering engineer crafts a song-to-song dynamic balance within the project, they also help position the entire project within a whole genre of contemporary releases. Classical and jazz audiences often favor a wider dynamic range. But on pop releases, the mastering engineer will usually be asked to squeeze the apparent level ever louder, while employing every bit of skill and knowledge they can muster to retain a semblance of fidelity. In either case, the choice is made with the artist’s goals and audience in mind. Ultimately, in addition to all of the above, a great mastering engineer is a fresh set of experienced ears — ears practiced in the specific art of making finished stereo mixes sound better. Using the tools at their disposal, they can very often reveal and enhance a level of gloss, excitement, and detail in the music that you hadn’t even imagined possible. The best in the field can transcend the craft and actually improve the art. As a result, if you choose wisely, mastering represents one final opportunity to let someone else make you look good! Brad Allen Williams is a NYC-based guitarist, writer/composer, producer, and mixer. He has worked with artists such as Cory Henry, Bilal, Kris Bowers, and José James on stages around the world. As a leader, his 2015 album Lamar received critical acclaim in numerous mainstream outlets including The New York Times. In addition to being an in-demand session player, he collaborates with many artists as a writer, producer and mixer, working primarily from his home base The Bunker Studio in Brooklyn, a two-suite facility he helped to build.